Taking a wrong turn and ending up on the steepest incline I've ever seen. With a red traffic light at the top. And a fire car behind me. I stalled four times. Driving too quickly (within the speed limit, I hasten to add!) around a bend, not having time to brake for a cyclist who surprised me around the corner and needing to pull onto the other side of the road in front of an oncoming BMW. I made it. Just. Getting lost in Manchester, not realising the road in front of me was actually a roundabout and just carrying straight on without stopping. Luckily the car to my right was a fair distance away. "Breaking down" at traffic lights, putting my hazard lights on and then realising I'd accidentally knocked the gear into neutral, hence the reason I couldn't pull away. Pulling up too far away from the card reader at the work car park entrance, having to get out of the car to let myself in, stalling and having the barrier come back down before I'd started up again. This happened twice before my teaching assistant, who happened to be waiting in her car behind me, took pity and raised the barrier for me. I've made myself sound like a really, really bad driver, haven't I? I promise I'm not actually a dangerous driver. I mean, the driving too quickly around a bend was in my first week and I soon learned my lesson after that! The others are just stupid little mistakes. We all make them, right? Right? Good thing I have insurance, eh? To be honest, I always thought it was one of those boring adult things that you have to pay for but never really use. Like travel insurance. Or fancy towels. Yeah, turns out it really does come in handy. Who knew? As part of my insurance, I'm getting one of those smart boxes, like More Than Telematics, fitted. I'm really pleased I went for it actually since, if I have any more incidents (and let's face it, with my luck I probably will! ), I'll be able to prove that I wasn't speeding or driving recklessly. The box will track my driving, generate a Driving Style Score and, if all is good, it could save me money on my insurance next year. Glad I got all those silly mistakes out of the way in the first month! Post written in collaboration with More Than. Rich doesn't know about most of these. I'm pretty sure he won't let me back on the road now. Sorry Rich! My mum hadn't driven in over 10 years when we got a cheap little car. Not long after we went somewhere new where she had a job interview. On the way we accidentally pulled into someone's driveway and reversed into a wall and hedge getting out and then after the interview going home we had a bit of a near miss with another car on a corner where mum accelerated instead of braked - slightly needing the loo by this time there was almost an accident in the car. It doesn't help knowing in hindsight that when we took that car for it's MOT it failed so badly the garage wasn't sure how it was still going at that point. As for learning I'm hopefully getting my provisional license next month to start learning soon. I had a lot of similar experiences when I first started driving too, so you're certainly not alone! I also took a bend too fast in my first month of driving, and even though I was going way under the speed limit I somehow completely lost control of the car and because it was in a country lane I ended up rolling my new car down the ditch. Thankfully I was OK and the car on the other side of the road was a fair distance away! Put the car into 1st rather than 3rd off a roundabout and almost drove into hedge. I had somebody trying to get on the road in front of me which scared me so much that i instictively pulled to the other lane nearly hitting a car which was trying to pass me. I once drove through red because i got distracted by a cyclist next to me. When i was approaching it, it was still green but apparently while i was paying attention to the cyclist, it turned red. I several times nearly cut somebody because i did not notice the street from the side. Best part, i don't even have a license yet. This is just from practise and lessons. Sometimes i think i really should not get a license. But without it you are really screwed. Hi New Follower and "newish" driver. I actually passed my test when I was 18 but I met my other half who had a car and just never drove until last December when I got offered my dream job which was 22 miles away. I had to start driving again, so after a weeks refresher in my husbands small white van we went and bought my little fiesta so I would have a car of my own. The first week of work I was a driving wreck, my other half was on holiday so he drove over and back with me, and coming back it was pitch black, never driven in the dark before but the best thing for me was the next week when I went it alone and I have never looked back, and nobody saw these mistakes! Accidentally putting it in reverse instead of 5th whilst at speed. Overtaking something that sped up and just got in. Hitting a kerb and scraping my tyre. Two punctures and a damaged alloy - both not my fault - first was a pothole on the dual carriage way, the second was a large unavoidable rock. Also a now dead pheasant cracked my number plate. It will get better, just don't get over confident (if that makes sense) and make sure you ignore the idiots on the road who think they are driving ferrari's! Haha the joys of beginning driving! The driving process is really different in NZ, so I actually started driving when I was 15... really great having so many 15 year olds behind the wheel! I've never had too many bad incidents. The only one I remember was backing up straight into a truck and smashing up my rear break lights. I do the same thing in parking garages all the time - I can never get close enough to the card reader! When I was a few weeks away from my driving test and still had my permit, I pulled into a parking space next to a building and accidentally hit the gas instead of the brakes and slammed into the building! Luckily it was cement so I did no damage to the shop and everyone in the car was fine, I was just really embarrassed! I then had to wait another 6 months until I could take my driving test! I always say you don't start to learn to drive until you've passed, all those little mistakes and near misses are what you learn from. I've had a lot in my time. I've reversed into a bollard, pulled out when I shouldn't have at a roundabout and many other little moments like that. Luckily no accidents other than breakdowns. Love this. We passed around the same time, go us. Erm I was never taught bay parking, and I avoid those spaces but couldn't the other day and hit the side of my car. Thankfully, it wasn't damaged and a lovely man parked for me as I was flustered. I thought I was bad having 4 cars in 2 years! I did things similar to these after just passing, the hill start is such a nightmare! I once stalled 6 times on a hill start and the traffic behind me was ridic, luckily I had a nice lady behind me who didn't beep. I definitely think that you learn more about driving after you've passed your test! I've been passed for over a year now and still haven't braved driving on the motorway! Literally been unable to reverse out of my spot at Starbucks so calling my boyfriend to come and do it for me. Whilst people watched in pity. I reversed into a skip the other day because someone was rushing me to park. I've been driving for about 7 weeks after passing in April 2014. Dreading to take it into the garage to see how much it costs to fix! Will never be rushed again!! 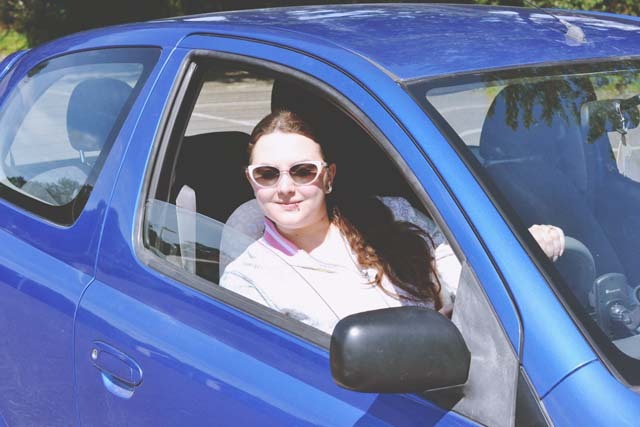 I still haven't passed my test, so no mistakes as a new driver yet, but plenty as a learner. Including the slightly too fast around corners, and going too wide/narrow around things and being on the wrong side of the road. Also I was tired once and nearly braked at a green light (nope, no idea what I was thining there either. ).